Marin Cilic briefly resumed his match with Guido Pella on No. 1 Court, but another shower saw them depart with the third-seeded Croatian leading 6-3, 6-1, 3-4 – a break down in the third set. The 62nd-ranked Mladenovic was only slowed by a 30-minute rain delay as she cruised to victory without facing a break point. Williams progressed earlier with a 6-1, 6-4 victory over Viktoriya Tomova. Although play swiftly resumed on Centre Court – and also on No. 1 Court where third-seeded Marin Cilic was two sets up against Guido Pella – a second shower that began as Mladenovic clinched victory has seen play suspended on all courts once more. A number of other matches on the men’s side of the draw remain in the balance. Ninth-seeded John Isner is serving at 3-4 in the fifth set against Belgian qualifier Ruben Bemelmans. After knocking out sixth-seeded Grigor Dimitrov, Stan Wawrinka is struggling to back up his first-round performance as he trails Italian qualifier Thomas Fabbiano by two sets. Play has been halted by rain at Wimbledon. It’s the first rain break of this year’s tournament after two days of sunshine. Jan-Lennard Struff will face Roger Federer in the third round at Wimbledon after a 6-7 (5), 3-6, 7-6 (4), 7-6 (4), 13-11 comeback victory over Ivo Karlovic. Despite being on the receiving end of 61 aces from Karlovic, the 64th-ranked Struff prevailed in just short of four hours as he sent down 31 aces of his own. The final point count was 206-205 in Struff’s favor, with the German player’s first break of serve coming in the last game of the match. His reward is a meeting with defending champion Federer, who earlier defeated Lukas Lacko 6-4, 6-4, 6-1. The 36-year-old American next faces German Tatjana Maria or Kristina Mladenovic of France. Second-seeded Caroline Wozniacki is battling a difficult opponent and a swarm of flying bugs at Wimbledon. The Australian Open champion complained to the chair umpire about the bugs that invaded No. 1 Court after she lost the first set 6-4 against Ekaterina Makarova of Russia. After shaking her head repeatedly on court to get the flying insects out of her hair, the Dane asked for bug spray to be used. That seemed to do the trick – at least when it came to improving her own game. Wozniacki won the second set 6-1 to level the match. After hitting just four winners in the opening set, the 44th-ranked Monfils improved to a total of 49 for the match and reached the third round at the All England Club for the seventh time in his career. Last year Querrey defeated Andy Murray to reach his first Grand Slam semifinal, where he was defeated by Marin Cilic. 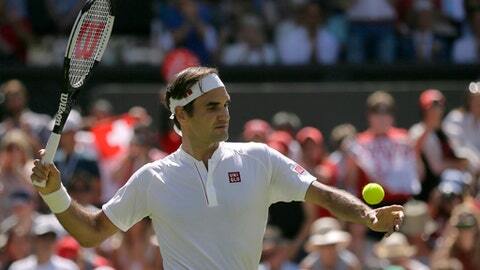 Roger Federer won 35 straight points on his own serve en route to beating Lukas Lacko of Slovakia 6-4, 6-4, 6-1 in the second round of Wimbledon. Kyle Edmund is facing some unexpected conflict as he prepares for his second-round match at Wimbledon. And it’s got everything to do with the World Cup. Edmund is English. His coach, Fredrik Rosengren, is Swedish. Guess which two nations play each other in the World Cup quarterfinals in Russia on Saturday? On Wednesday, a day after England and Sweden set up their match with victories, the 21st-seeded Edmund posted a photo to his Twitter account, showing him and Rosengren at practice – posing in a fighting position and each wearing his nation’s soccer jersey. ”When your coach is a Swede and you tell him it’s coming home. let’s go England!” Edmund posted, referring to the slogan his country’s fans have been using to suggest their team will win the World Cup. If he beats Bradley Klahn of the U.S. on Thursday, Edmund will be hoping his third-round match on Saturday is scheduled at a time that doesn’t conflict with a certain soccer match. Lucas Pouille became the latest seeded player to exit the men’s draw at Wimbledon after a 6-4, 6-2, 6-7 (8), 3-6, 6-2 defeat to Austrian qualifier Dennis Novak. The 171st-ranked Novak defeated Peter Polansky on Monday to record the first Grand Slam victory of his career. Novak will next face 2016 Wimbledon runner-up Milos Raonic, who hit 34 aces in his 7-6 (4), 7-6 (4), 7-6 (4) victory over John Millman. Karolina Pliskova advanced to the third round of Wimbledon for the first time with a 6-3, 6-3 victory over Victoria Azarenka. Seventh-seeded Pliskova didn’t face a break point as she cruised through a meeting of the two former No.1-ranked players on Centre Court. It was the sixth time in seven main draw appearances at Wimbledon that 2016 U.S. Open runner-up Pliskova had advanced to the second round, but she had previously failed to go any further. Wimbledon’s commercial director has no issues with Roger Federer pulling off a marketing coup on Centre Court. Federer drew headlines around the world when he walked onto the court wearing a Uniqlo outfit on Monday for his opening match after ending his decades-long partnership with Nike. It was the first time the eight-time Wimbledon champion had worn the brand publicly, but organizers said he didn’t violate any of their strict rules in regards to using the tournament for marketing purposes. Mihaela Buzarnescu of Romania has become the first player to book a place in the third round of Wimbledon. The 29th-seeded Buzarnescu beat Katie Swan of Britain 6-0, 6-3, clinching the match with a backhand winner on No. 3 Court. She was joined in the third round minutes later by 10th-seeded Madison Keys of the United States, who dispatched Luksika Kumkhum of Thailand 6-4, 6-3. Buzarnescu is making her first appearance at the grass-court Grand Slam, having risen from 213th in the rankings a year ago to No. 28. Swan, ranked 204th, was given a wild-card entry to the tournament. Keys reached the quarterfinals in 2015 but lost in the second round last year. Play is underway on Day 3 at Wimbledon, with former finalist Milos Raonic of Canada among the early starters as the second round begins at the All England Club. The 13th-seeded Raonic was playing John Millman of Australia as he bids to reach the third round for a sixth straight year. He lost the 2016 final to Andy Murray and reached the quarterfinals last year. No. 10 Madison Keys of the United States was the highest-seeded woman in early action, playing Luksika Kumkhum of Thailand. Roger Federer and Serena Williams were both set to play on Centre Court later. Roger Federer and Serena Williams are both back on Centre Court at Wimbledon on Wednesday as they look to advance to the third round. Federer will play Lukas Lacko of Slovakia as he continues his quest for a record-extending ninth title at the All England Club. Williams then faces Bulgarian qualifier Viktoriya Tomova as she goes for a 16th straight match win at the tournament – having missed last year while pregnant. Australian Open champion Caroline Wozniacki and last year’s men’s runner-up, Marin Cilic, are also back in action as they try to avoid more upsets at the tournament. Three of the top-10 seeded men lost in the first round, while former champions Maria Sharapova and Petra Kvitova also went out on Tuesday. The forecast calls for more sunny skies, although there is a 30 percent chance of rain showers in the afternoon.